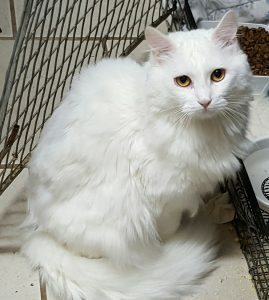 This gorgeous long haired white female cat was supposedly tossed out of a high-rise window, or she fell out. Either way, she landed at our rescue with a fractured jaw. 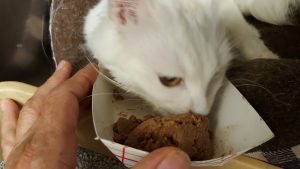 It took months of syringe feeding before she could eat on her own. She’s completely healed now and has put on a little weight. She’s a friendly cat and she gets along with others but tends to be a little standoffish. She loves to be petted but not held. She’s felv/fiv tested, up to date on vaccines and microchipped.